Scentsy Wax is made specifically to melt in the Scentsy warmer, we recommend you use only Scentys wax in your warmer. The Scentsy bars warm up only enough to let the Scent evaporate into the air. Each season Scentsy offers over 80 amazing Scentsy Scents. Use the Scentsy bars to fill your home with an incredible Scentsy aroma! Scentsy Bars come in a pre-molded container holding eight squares. They are approximately 2.6 oz. 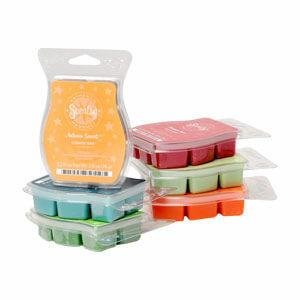 of high quality wax.The Scentsy Bar is designed to be broken apart into 8 differnet sections/pieces. Use one piece in the Scenty Nightlight and one or two pieces in the full-size Scentsy Warmers. Each Scentsy wax bar last 60-80 hours. There are so many great things about Scentsy Wax. Using Scentsy wax allows you to control how much scent you want. Do you prefer the scent to be stronger? Add more wax. If you don’t like really strong scents, you can cut the square (1/8th the bar) into smaller pieces so you can control how much scent you want. Classics: Our most popular Scentsy Scents. These are the all time favorites! Remember running among the fresh, white sheets hanging from your grandma’s clothesline? Or biting into a big blackberry so ripe its juice runs down your chin? Whatever memories you hold dear, relive them with the Favorites loved by new and returning customers alike. Whenever I am asked by someone new to Scentsy what scent to try or someone is looking for a gift and having a difficult time picking the perfect scent, I always suggest a scent from our Scentsy Favorites collection. These are the top selling scents and a great choice! Looking for a clean scent? Try Clean Breeze which smells like fresh laundry or White Tea and Cactus which is perfect for those that don’t like anything too strong. Do you like the homey smell? Something with cinnamon? Try Welcome Home (a personal favorite during the fall!) Check out the combine and save to get more for your money! Spring and Summer: Scents that capture the season. Florals and tropical Scents. Need a tropical vacation, something to lift your spirit? Try one of these Scentsy Scents.Want to change your mood? As Jimmy Buffet says, Changes in Altitude, Changes in Attitude! Why not indulge in one of tropical Scents for a taste of the tropics right at home. Warm Camu Camu and instantly be transported to that beach vacation you have been dreaming about! Cafe Corner: These are the Bakery Scents, perfect for all the Foodies! Do you love bakery scents? Scentsy Corner Cafe is for you! Scentsy Bakery Scents, the Corner Cafe Collection, are some of our strongest Scentsy Scents. It’s what you reach for to start your morning or to put a cap on a perfect meal at the end of the day: dark coffee, rich buttery pastry, sweet berries, creamy vanilla. Scentsy’s Corner Café Bakery fragrances are rich, luscious indulgences that whisk you to your happy place. Perfect for the foodie or the one who wishes they could bake! The Scentsy Bakery scents are also great for entertaining or if you have your house on the market. Vanilla is a warm and inviting scent and brings back so many wonderful memories. Romance: Holding hands on the front-porch swing, a picnic for two under the stars, or a night on the town in a little black dress. Do you dream of a film-worthy romance or the simple pleasures of a night spent under the stars with the one you love? Find a fragrance to match your desire in Scentsy’s Romance Collection, Sultry, sweet, and playful scents offer new ways to tempt and delight. Scentsy Romance scents are great for the bedroom and bathrooms. Scentsy Man: Whether your style is a pressed shirt and shiny cufflinks or soft flannel and worn work boots. Whether you are splitting logs at a mountain hideaway or hitting the trendiest club in the big metropolis, there’s a Scentsy Man fragrance for you. Warm woods, fresh herbs, and rich spices will awaken your spirit of adventure—and curiosity for all things new. The masculine collection of Scentsy Man scents are a great gift for the men in your life. The perfect addition to the Man Cave! Cover up the scent of stale cigar with one of our amazing Scentsy Man scents, instead of a flowery or powdery scent, you man will thank you! Spa: When the kids are crying, the boss is calling, and you feel like you’re constantly running 10 minutes late, it’s nice to know you can get away. Scentsy’s Spa fragrances let you take a moment to relax and unwind wherever you are. Clean, sunny, or earthy notes mingle with soothing musks and sheer florals help to create your own spa environment at home or wherever you maybe. Take a moment and create the ultimate relaxation experience—even amid the chaos of the day. If you need more help picking, contact me.